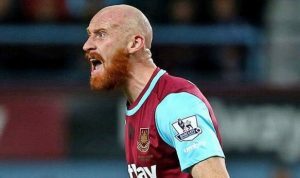 New Aston Villa boss Dean Smith is taking a look at James Collins as he considers giving the 35 year old a second shot in the club’s claret and blue. Ginge is training with Villa this week as he continues to build towards full fitness following a hamstring problem. earlier in the month. Former Villa boss Steve Bruce had him at the club and was close to offering him a deal before he parted company with the Villains and former Brentford boss Smith took over. Now Ginge is on a mission to impress the new man at Villa Park. He has previously been linked with both Bristol City, QPR and Ipswich Town earlier in the season but it looks as if Villa is his best hope of continuing his career. City were keen on signing a defender, and Collins attended their win over QPR in August, leading to speculation he could be signing for Lee Johnson’s side, or moving to Loftus Road.